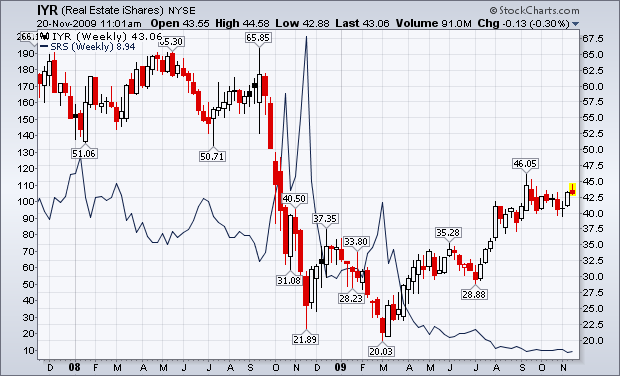 Let’s use SRS, the 2X inverse of IYR, the commercial real estate fund as an example. Let’s say that two years ago you thought that commercial real estate was a disaster waiting to happen and so you decided to use SRS to bet against it. Well, if you bet against IYR you were 100% right, but if you used SRS to do it you went BROKE in the long run. Yes, some people made money on the WILD swings, but most gave it right back. Huge swings occur because of the math of compounding DAILY numbers... So that, you may be up over a few days, but then it corrects 5%, and then another 5%, and then another... but you would not have lost 15%, you would have lost WAY more than that because the numbers compound. Also, these ETFs have HUGE fees and "slippage" that KILL their performance over time. You WILL lose if you gamble with them too much. Below is IYR with an SRS overlay, 2 years. Note that at the beginning of the chart that IYR is at $170 and that SRS is at $100. If you bet against IYR using SRS and held, you would have gotten the direction correct as IYR is now worth only $42, A HUGE 75% PLUNGE, and YET your "investment" in SRS is only worth $8.92!!! That means that despite being RIGHT, you LOST 91% of your investment!!! I'm WARNING everyone here about these, they are the house and they are going to rob you blind, get it? Now then, if you wish to bet against the market using single inverse ETF's, that's great, but again, they are not LONG term, buy and hold instruments. The inverse relationship will NOT be one to one over the long term, so that if the market moves down 20% over 4 months, you will likely NOT make 20%. You must know how these things work if you are going to gamble with them. Also, if you're betting on a market meltdown, be aware that these are derivatives and that at some point there may very likely be counterparty issues. There are certain times and applications where they are appropriate for the right people. They are not for everybody, please be careful.